Tried red thread and it screamed back at me. Picked it out. Thinking about using black or white thread, what do you think? Thanks in advance for your help. How about a variegated grey? Just a thought. I like the gray idea, too! ​You could use smoke invisible thread. Nice job keeping all the borders straight. A variegated grey does sound nice. If it were mine I would probably go with a variegated red. Pale grey. i think black would scream on the white just as the red did. White might be a bit stark on the red.Grey should disappear and let your colors do the shining. I'd go with gray, either variegated or just a medium gray. It will blend nicely with all of the colors. Gray, either light or variegated. White or a very pale gray. My first thought was a variegated thread, and gray is a great idea, Watson. White always works for me. King Tut has some great grey/black subtle variegated. Have used it several times. I'd use white. It will show up in the darker areas, and won't make the white fabric look dirty. I lay out all the colors I want to use on the quilt and see which one appeals to me. Laying them out and seeing them all together brings clarity for me and makes the choice much easier. What often sounds good, when laid on the quilt really doesn't look good at all. Edited to add: I am a big fan of contrast on a quilt with my threads, even though I am not a very good quilter. I probably would have started with a red too. And sometimes, just a little bit of a color on the quilt, doesn't look that good, but when you do the whole quilt, the color really takes it up a notch. Last edited by Barb in Louisiana; 09-25-2017 at 04:54 AM. 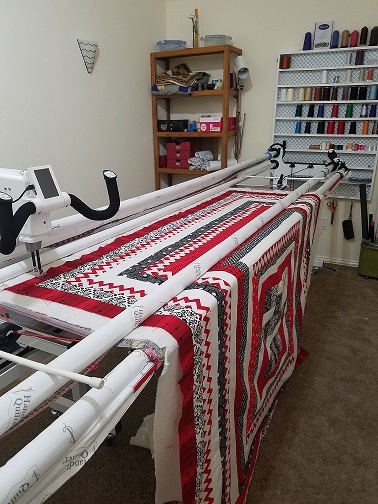 What kind of quilting are you planning on doing? Invisible in SID and the change colors to match the color of the piece you are quilting for meandering or custom . IE. white on white- red on red . Also what color is your backing? Remember often the stitching will show up as dots on the backing. Doing a pantograph and the backing is red flowers on black background. I made a similar colored quilt last year. 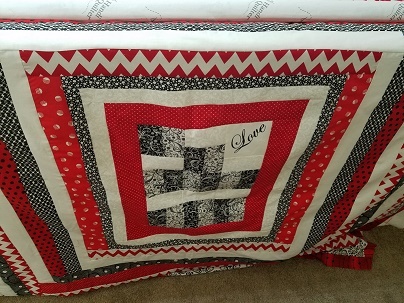 My quilter used grey. It let the fabrics shine and the quilting is subdued. Lemonaid (Permanent Core) is a great blending thread. Does not look yellow anywhere, not even on the white. I would not use the gray, verigated or black. They are too stark.